Espresso acts to intensify the flavors of cocoa and stout, without overwhelming. Topped with ganache, then pretzels and salt. Wow! 1. Preheat the oven to 350°F. Line muffin tin with paper liners or spray with nonstick cooking spray. 2. In a large mixing bowl, combine the stout, milk, vegetable oil, vanilla and espresso. 3. Beat in the eggs, one at a time until thoroughly incorporated. Add in the sour cream and mix until combined. 4. In a large mixing bowl, whisk together the cocoa, sugar, flour, and baking soda. Gradually mix the dry ingredients into the stout mixture. Batter will be thin. 5. Bake for 18-22 minutes, until risen and set in the middle but still soft and tender. Cool completely on wire rack. 1. Place chocolate in a large heat safe bowl. Set aside. 2. In a medium saucepan, heat heavy cream over medium heat until it just begins to boil. DO NOT walk away from the stove. The cream could boil over and you will be with a big mess to clean up. 3. Immediately pour hot cream over chocolate and let it sit for five minutes. 4. Begin stirring the cream with a wooden spoon or whisk starting in the center of the bowl and working your way outward. As you stir, you will see the cream and chocolate come together. Allow your ganache to cool for 15 minutes and stir in vanilla. Let ganache sit at room temperature for another 3-45 minutes before topping cupcakes. Invert the top of the cupcake into the bowl of cooled ganache, use a spoon or offset spatula to spread evenly. 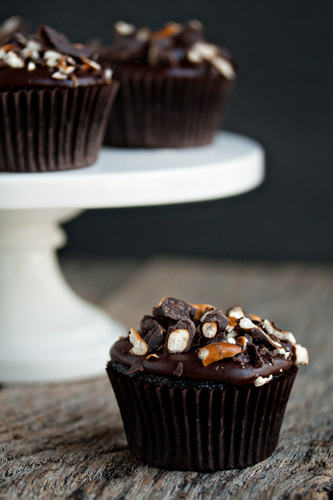 Finish cupcakes with chopped chocolate covered pretzels and a tiny pinch of fine grain sea salt. - Cupcakes are best served the day they are made due to the fact that the pretzels will soften overnight.